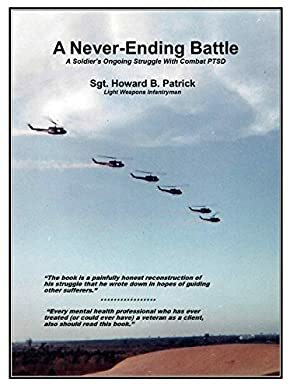 Howard Patrick, a combat veteran of the Vietnam War who suffered from acute Post Traumatic Stress Disorder for over 40 years, wrote his autobiography in the hopes it would provide his family with an understanding of how his wartime experiences and PTSD changed him, thereby affected their lives as well. Not only did his family benefit from reading it, the book had a very positive impact on others beyond his family circle, including veterans and medical professionals. The feedback he received was so overwhelmingly positive he published his book to help other combat veterans who may also be suffering from the grips of post traumatic stress, as well as provide valuable advice and support to their families. Log In to track Howard Patrick on eReaderIQ. to be notified each time the price drops on any book by Howard Patrick. to stop tracking Howard Patrick. We started tracking this book on November 9, 2015. The price of this book has changed 10 times in the past 1,257 days. The lowest price to date was FREE last reached on November 7, 2018. The highest price to date was $5.99 last reached on November 14, 2015. This book has been $5.99 one time since we started tracking it.